I know it sounds like a mouthful, but this is a really fun, delicious and really healthy recipe for baby, and I actually really liked it as well! Quinoa is an amazing grain that adds a lot of texture, nuttiness and creaminess to plain pasta dishes. It can have a really mild crunch if you want it too and it is considered a great source of complete protein, meaning it contains all 9 amino acids. It also has a bunch of magnesium which is really good for your cardiovascular health. I will definitely use this recipe as a side dish when the babes grow up. A great way to sneak those great green veggies in those little developing bodies! Combine quinoa, pastina and water. Bring to a boil. Reduce and cook for 12 minutes, uncovered. Remove from heat. Stir in broccoli, spinach and half the cheese. Cover and leave for 7 minutes. 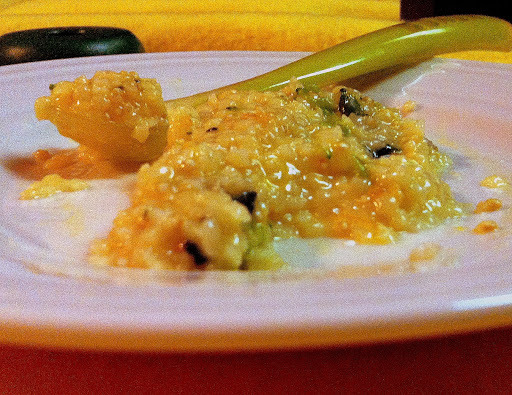 Stir in the rest of the cheese and make sure all the ingredients are incorporated and the dish has a creamy texture. Again, feel free to do your own thing here, you know your baby. Maybe they would prefer less vegetables, or more cheese, or milder tasting vegetables. I had to add some salt when I ate it, but my son liked it just fine plain.